The arrival today of the first two operational joint strike fighters will strengthen the deterrent effect of the whole Australian Defence Force, says Air Marshal Leo Davies. 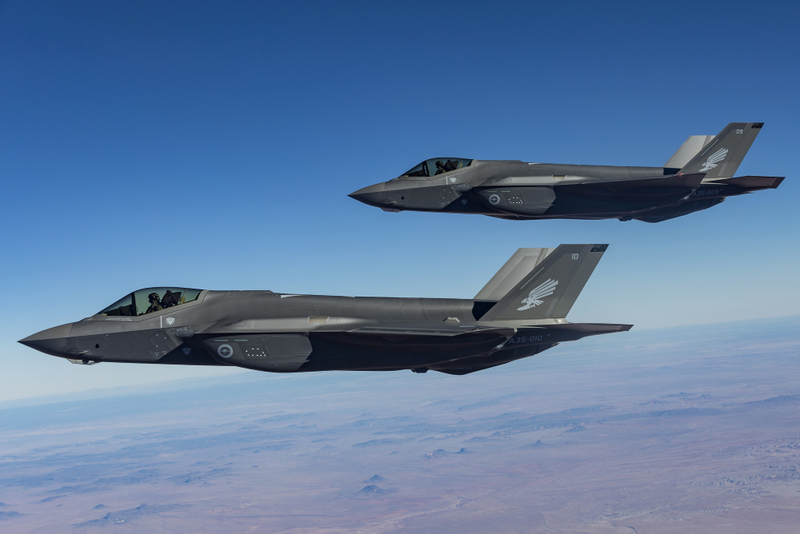 The Royal Australian Air Force chief tells The Strategist that allies and potential enemies will look at the ADF, with its stealthy fifth-generation multirole F-35A jets as a key element, and what the force is able to do. The RAAF must be able to provide options for the government that are reliable against any potential enemy, no matter how sophisticated, Davies says. ‘In our region and abroad, multiple countries are enhancing their air combat capabilities. So we need to maintain a level of sophistication that allows us to do what we need to do when we need to do it. Davies says an F-35 pilot will be able to characterise an adversary’s aircraft, land forces and ships and then choose how to react to them. Sometimes that will mean not reacting and just monitoring the enemy’s movements. Sometimes it will mean ‘cuing’ another asset such as one of the RAAF’s F/A-18 Hornets, or an air warfare destroyer or, in due course, a ground-based air-defence system. The comparison has been made before, says Davies, but it works well. Ordinary aircraft operated like instruments in a band; the F-35 now becomes the conductor. In doing that it will make aircraft such as the Hornet, Super Hornet and Growler much more capable. An F-35 deep in enemy territory will be able to send information to a Super Hornet a safe distance from enemy defences to identify a target and provide a mass of information about it. That will allow the Hornet pilot to launch a weapon at very long range with great precision and confidence about the target. The fidelity of the data the F-35 can pass to a commander on the ground is exquisite, he says. In the battle to drive the Islamic State terror group out of the Iraqi city of Mosul, the RAAF’s Hornets were able to send back a lot of information about what was happening in the streets below, but they weren’t able to bomb while they gathered and dispatched that intelligence. The F-35 can maintain its air-to-air situational awareness, pass data to, for instance, a Wedgetail command-and-control aircraft and provide data to the ground commander at the same time without reducing its own ability to fight. The F-35 is not ‘invisible’, Davies says. ‘What the F-35 brings is a reduced signature available to the radars trying to find it and a reduced heat signature.’ That makes it harder to locate using infrared scanners. ‘It also has communication systems with what we call “low probability of intercept”. Information is sent in short bursts using minimal energy and precisely targeted for whomever it’s intended for.’ Davies says the aircraft is able to safely penetrate far deeper into hostile territory than other aircraft. RAAF squadron leader Edwin ‘Red’ Borrman has been flying the F-35 in the US for three years and training pilots from Australia, the US and other nations. He flies one of the two new aircraft to Australia today. A highly trained fighter pilot who has practised, and taught, everything from long-range attack to dogfighting, Borrman says the F-35 is very advanced and can do what other aircraft could not risk doing. ‘The jet is built for the first couple of days of a mega-conflict, to go all the way down-range to a very high-threat environment and be able to find, locate and hit its target—or to hand off targeting to other aircraft—and then get out of there alive. Borrman is often asked if the F-35 is much better than existing strike jets. Lieutenant Colonel ‘Chip’ Berke is a retired US Marine Corps pilot who has flown many older jets as well as the F-22 Raptor fighter and the F-35. He’s been a ‘top gun’ instructor and, as the first operational pilot to fly the JSF, he’s possibly the most knowledgeable practitioner on fifth-generation capability. Berke says past combat aircraft tended to operate in some isolation in a predefined airspace with a predefined role. ‘You might come back and pass on information you’d gathered to build up a picture. ‘Fifth-gen airplanes are totally different’, he says. They provide the pilot with an unmatched amount of information which can be shared immediately with other units in the air and on the ground and the sea. Brendan Nicholson is defence editor of The Strategist. A version of this article was published in today’s Australian. Image courtesy of the Department of Defence.